The nectarines have arrived in the market, radiant with summery red and gold. Their season here is painfully short, and this year the local orchards were hammered by a series of spring storms, so what fruit managed to make it to market is precious. We have to enjoy them while we can. I love nectarines most of all straight from the fruit bowl, and I happily, greedily, eat them two or three at a time, just the way they are. At the end of a long, lazy lunch, we drop slices into a glass of wine wine or prosecco for an instant, effortless summer dessert. 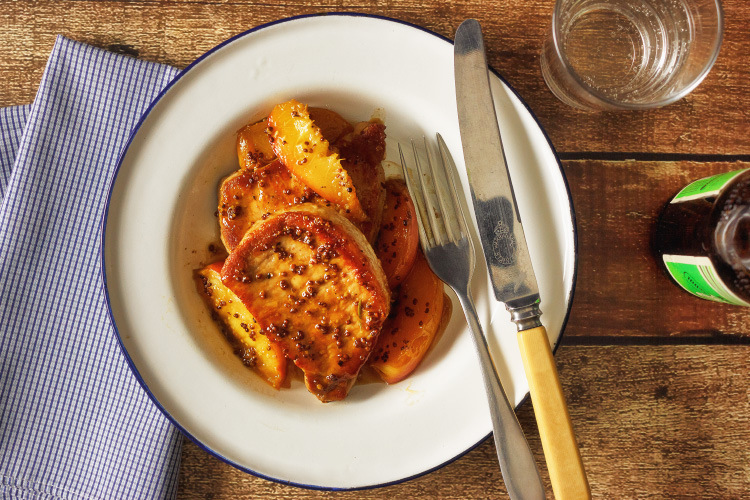 This is another much-loved way to take advantage of nectarines, giving them a brief roast along with some medallions of pork loin and a sauce of wholegrain mustard and apple cider. The combination of the mustard and cider (the sharper, the better) with the sweetness of the pork and nectarines is irresistible. Everything happens in one pan – happy days – and in about 15 minutes. Perfect weeknight easy. Heat the olive oil in a cast-iron skillet (or other ovenproof pan) over medium-high heat. Season the pork with salt and pepper and sear for 2–3 minutes a side, just until sealed and golden. Transfer to a plate. Add the cider, rosemary and mustard to the pan. Bring up to a boil, scraping the bottom of the pan as you do. Continue to boil until you have reduced the volume to about half. Return the pork medallions to the pan, turn them in the sauce and and put in the oven for 6 minutes. Meanwhile, prepare the nectarines by removing the stone and slicing into 6 wedges each. Take the pork out of the oven, turn it and surround with the nectarines. Return the pan to the oven and cook for a further 8 minutes. Transfer the pork and nectarines to serving plates. Whisk the butter into the pan juices and spoon over.